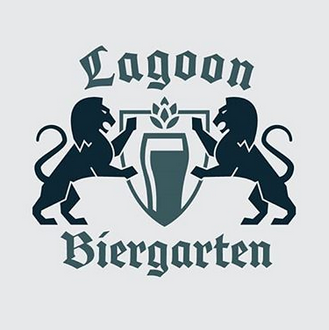 The Lagoon Biergarten is a new restaurant area just south of Roller Coaster debuting during the 2019 season. According to Lagoon's 2019 park map, the Biergarten will feature two themed restaurants. Lagoon has not announced a specific opening date for the new area. Construction on the Biergarten began during Lagoon's 2018 season with a teaser for the new area appearing in September. The area was fenced off with mesh covering that had the Biergarten logo on it along with the words "opening in 2019." Lagoon Is Fun Forum user CoastersN'Stuff was the one to share this originally. You can see that image below.